Leading Service Provider of lawn maintenance service and garden maintenance service from Noida. With the constant support of our dexterous crew of professionals, we are fulfilling the varied requirements of clients by providing them Lawn Maintenance Service. This service is carried out by our skilled professionals using superior grade gardening tools and modern techniques. The offered service includes path clearance, mowing of lawns, tree surgery, pruning and weeding. 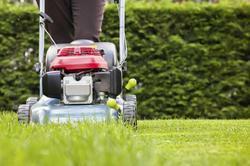 A regular mowing of your grass not only keep your garden looking its best but also produces a healthy blade of grass. Broadly appreciated for their fuss free management, we provide these services to our clients at plausible rate. Backed by a team of highly skilled professionals, we are engaged in offering a wide spectrum of Garden Maintenance Service. Our customers can avail this service from us as per their varied needs and demands. Backed by our experienced professionals, we render this service by using ultra-modern technology in sync with industry norms. Moreover, this service is highly appreciated in garden owing to their cost effectiveness.